There was a woman on the train yesterday reading this here Dental Secrets book. I can't quite figure it out, but I find the title hysterical. 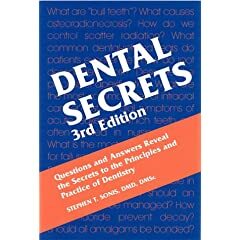 I'm sure it's a useful book for a dental student, but secrets? What are they hiding from us patients? Maybe they are hiding the fact that you don't have to floss every day. Actually, I can think of one. People with bulimia have dental secrets, in that the disease dissolves enamel (the throwing up, to be specific). So they often have teeth that look very bad given their age. Must be from the same publishers as the brochure I posted about ("Your T&A Journey"). I chalked it up to cluelessness, but most commenters called it shrewd marketing!